If you care about your virtual security, Web Security App might be an application that you consider installing, but we must warn you not to do that. Why? This application is nothing, but a useless adware program that, instead of protecting you, may put your system security at risk. How does it do that? Through the third-party advertisements it may put on your computer screen while you are browsing the web. Since it affects all major browsers, you have no escaping it, unless you have the latest version of Google Chrome as that blocks this extension already. Does that sound like a warning sign? For us, it definitely does even if it is only the tip of the iceberg, which you need to avoid hitting if you care about your computer and your virtual security. Please read on if you want to know why and how you should remove Web Security App from your computer. 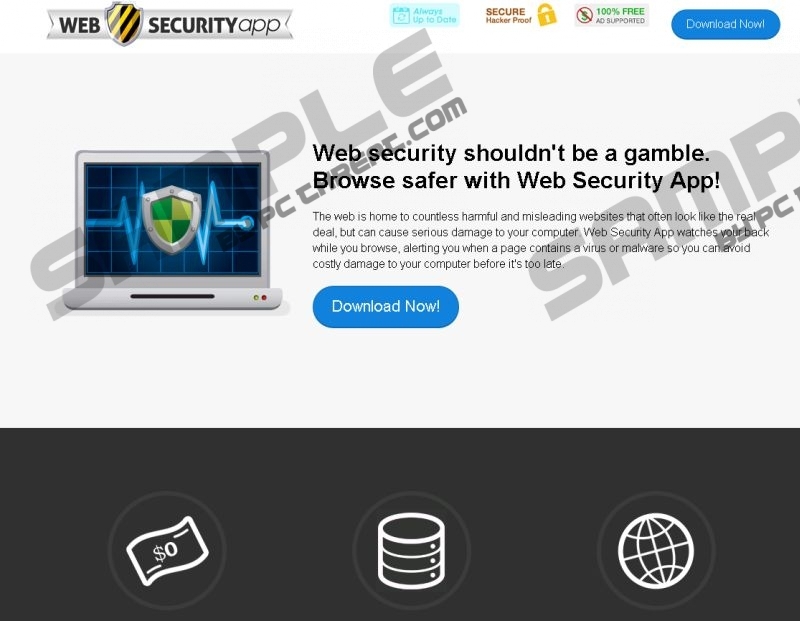 You can find the official website of this application at websecurityapp.com; although, what are the chances of anyone really ending up on this website unless they actually know the URL? Not too much. With a name like this, there is no way you can find a hit on that website if you Google it; at least not on the first few pages for sure. However, even if you happen to land on it in some miraculous way, there is no way you can download Web Security App from there. If you click on the “Download Now!” button, all you get is a pop-up message telling you that this browser extension is currently not available for download. What does that tell you about this application? Certainly, it does not mean that this extension is reliable and well-functioning, right? Then sad news is that Web Security App cannot be stopped spreading even if it is not downloadable on its website. How can it emerge on your computer then? Well, the developers at Intriguing Apps make sure that this adware gets to a lot of users so that they can make money through them. As a matter of fact, they use the infamous software bundling distribution method. It has become infamous because of the fact that schemers started to use it to spread malware programs on the net. You may find potentially unwanted programs, browser hijackers, and adware programs in an infected bundle together with authentic free software. If you downloaded such a bundle from a questionable file-sharing website, chances are your system is already struggling with multiple malware attacks. That is why we suggest that you delete Web Security App and all the other infections that may be on-board. Otherwise, your PC will not be safe to use. Web Security App is supposed to be “a free, ad-supported program designed to block malicious websites.” But, unfortunately, it acts the opposite way; in fact, it can pose a threat to your Windows operating system by showing potentially harmful third-party ads. One click on the wrong ad and you might be taken to unreliable websites. What can happen there? Well, you might be tricked into downloading an “urgent” system update, or running a vital system scan. The schemers behind such websites have a lot of ways to take advantage of you and may even be able to make you share your personal details with them. If you want to feel safe while surfing the web, you should remove Web Security App as soon as you can. If you understand the risks now, we think you are ready to step up and deal with this malware infection. Please follow our instructions below this article if you want to take matters into your own hands and would like to manually eliminate Web Security App. Keep in mind that there might be other threats on-board and you have to tackle this issue unless you want to wait till your PC gets crippled by them. The best solution would be the use of a professional malware removal tool that can automatically detect and fix all security-related issues. Click on the Windows button on the Taskbar. Tap Win+X and go to Programs and Features. Press Alt+F and choose Settings. Tap Alt+H and go to Troubleshooting Information. Press Refresh Firefox. In the confirmation window, press Refresh Firefox once again. Quick & tested solution for Web Security App removal.